After quadrupling its goal amount on Kickstarter and going on to make nearly five million dollars after additional funding, Torment: Tides of Numenera is highly anticipated by a huge number of fans that fondly remember Planescape: Torment and other tactical RPGs of the 90s. It’s now approaching a year after the original Kickstarter release estimate – right on track as far as these mega-projects go, really – and Alpha builds that show off specific areas of the game have started to go out. The latest is the Crisis system which manages time-sensitive situations like battles and confrontations. 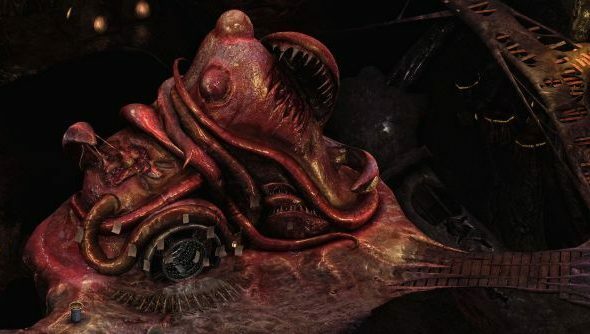 Torment is one of the upcoming games we’re most looking forward to. I like this a lot, not least because it more accurately emulates the options available in combat while playing a tabletop RPG than we usually get. Strip it all away and what you have is a classic Baldur’s Gate-style combat engine, but with far more interactable elements. These games are already masters of complex scenarios within combat where each move is possibly deadly and the addition of diplomacy only adds to that. I also quite like how out in the open a lot of Torment’s dice are – it’s telling you what you’re rolling and what you have to beat. Generally this stuff has been removed from the obvious UI across games in the last 20 years, but the clarity and ability to see how the roll has affected you exactly is something I prefer. It lets you know when you made a poor decision versus when you were simply very unlucky. I feel similarly about showing actual damage numbers when playing a game like TF2. Not so hot on the graphics on display here, which are a little too close to the 90s routes for me. Still early days, of course, and it’s not a game that lends itself to the prettiest ones imaginable in the first place.